Thank you messages for son: Nothing comes close to the pride that a mother and a father feel when they see their child growing up to be the epitome of how a loving son should be. This is when parents feel a sense of gratitude towards life and destiny for giving them a son whose upbringing has been worth all the sacrifices they have made in their lives. Write a cute note to say Thank You to your son if you think he deserves a pat on the back for being the man that he is. Pick a random day to post your sweet message on his Facebook or send him a text if you want to keep it personal. Your words will reverberate in your son’s heart and they will become the anchor which he holds on to later in life. 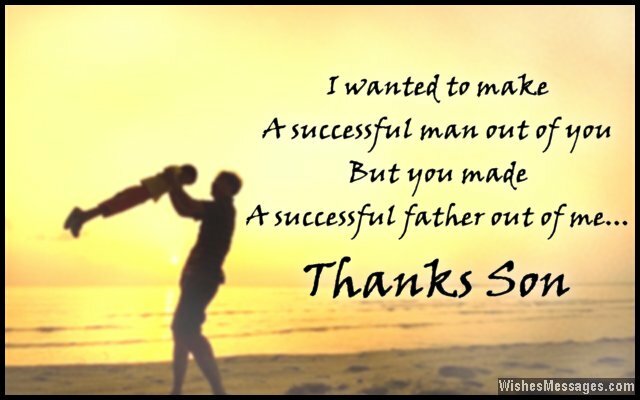 1) I wanted to make a successful man out of you, but you made a successful father out of me. Thank you son. 2) Unfortunately, our affection for you has always been masked in the yelling. Unfortunately, our love for you has always been hidden in the lessons you have learnt. Unfortunately, our care for you has always been disguised in the punishments we have given you. Thanks for bearing the brunt of our love, care and affection. 3) A rainbow has seven colors. But the rainbow of our life has a million, thanks to our wonderful son. 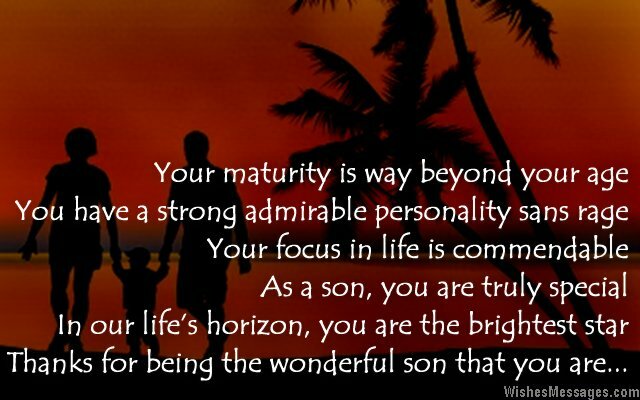 4) Dear son, you complete me in every way because you have all the strengths and qualities that I never had. Thanks. 5) A son thanks his father for giving him life. But a father like me thanks his son for making his life worth living. Thanks for everything, son. 6) We know that we have given you a thousand reasons to be frustrated while growing up. Now we feel guilty because you have given us a million reasons to be happy? Thank you son. 7) I am used to having a heavy heart all the time – weighed down by loads of love that my son gives me. Thanks. 8) My son has put me on life’ pedestal and the view of life from here is fantastic. Thanks dear. 9) In the process of showing you the purpose of your life, I’ve realized my own – loving a wonderful and successful son like you. Thanks for everything. 10) You are the best compliment that destiny has given me. Thanks dear. 11) I always taught you to respect people, but now I respect you. I always taught you to appreciate people, but now I appreciate you. I always taught you to be like other good people, but now I am glad you are the best by just being yourself. Thanks son. 12) Most men accept the troubles of becoming a father and supporting a family. But a son like you makes all that trouble worthwhile. Thanks. 13) We wanted to be hardworking potters and give your life good shape. But the way you have grown up, you have made us look like expert sculptors. Thanks son. 14) We hope that we have been successful in providing everything that you needed in life, for you have already done that for us by giving us so much love. Thank you for being perfect. 15) Parenting classes don’t need to hire tutors, but sons like you who can teach couples how to become great parents. Thanks. 16) Your maturity is way beyond your age. You have a strong admirable personality sans rage. Your focus in life is commendable. As a son, you are truly special. In our life’s horizon, you are the brightest star. Thanks for being the wonderful son that you are. 17) All parents wish the world for their sons. But only a few sons like you give the world to their parents in return. Thanks dear son. 18) Happiness comes in all forms, the best form being my son. Thank you. 19) Thanks for making us realize that we have made an important contribution to the world by giving birth to an intelligent and noble son like you. 20) I never knew I would meet my best friend all the way into my midlife crisis. Thanks for being there for your old man, son. 21) Even though I am not on Facebook, I still Like your thoughts. Even though I am not on Twitter, I still spread the word about your achievements. Even though I am not on Pinterest, I keep a collection of our best memories together. I love you, son. 22) We asked God to bless us with the best that life had to offer. That’s when he gave us a son like you. Thanks for everything, dear. 23) I fight with you for your good and you argue with me for my better judgment. In our perfect relationship, there is no room for improvement. Thank you son. 24) Techniques like meditation, Feng Shui and Yoga that claim to bring ultimate peace and happiness are of no use to me because I have a son like you. Thanks. 25) I never understood how people could be so committed, engrossed and passionate about a single cause – until you were born. Thanks for showing me the purpose of my life, son. 26) Every father dreams of having a son who gets a better life than him. But you did a lot more by giving your old man a life better than he already had. Thank you. 27) You are the reason for my pride, but you have also made me humble. You are the reason for my satisfaction, but you have also made me want more for you. You are the reason for my strength, but you have also made me cry tears of joy. Thanks son, for this lovely emotional roller coaster. 28) When I wanted my life to jump a bit, my destiny decided to take a leap by giving me a son like you. Thank you, son. 29) You are worth every trouble life has thrown at us, all the pain life has given us and all the ups and downs the journey of life has taken us through. Thanks son. 30) There are cool sons, obedient sons, nice sons and good sons. But mine went the extra mile and became the glowing sun of our lives. Thanks darling. 31) I may have given you birth, but you have given me the chance to be born again. Thanks darling. 32) Just like every girl has a dream man, every mother has a dream son – and that son is you. Thanks for turning out to be everything your mom could have ever dreamed of. 33) I give you wisdom, advice and counsel. You give me innocence, spontaneity and joy in return. We have definitely struck the right chord of life. Thanks son. 34) I would have been able to weather the storms of life, if you weren’t around to become my canopy. Thanks a lot son. 35) All the sacrifices I have made in my life to be a mother seem like tiny bumps because with a son like you, the journey has been heavenly and beautiful. Thanks son.